A German consumer association has filed a class action lawsuit against Volkswagen over the emissions scandal. VZBV, which represents 41 German consumer groups, accused the carmaker of "deliberately and unethically causing damage" to two million drivers. It is seeking a judgement on whether VW should be liable to pay damages to German consumers. The class action lawsuit is only possible due to new rules recently pushed through by German lawmakers. 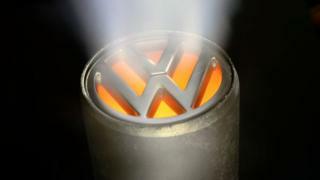 The BBC has contacted VW for comment and is waiting for a response. Consumer association Verbraucherzentrale Bundesverband (VZBV) told the BBC that German drivers feel betrayed and are out of pocket, due to the diesel emissions scandal. "The damage for every consumer can be several thousand euros and there is no sign of the car industry to compensate for the damage they have caused," VZBV spokeswoman Sarah Hoare told the BBC. "The legislator has provided us with a new type of legal means, which we are using without delay so that consumers are no longer left alone with their damages." A new law that came into force on Thursday means that consumers can now bring a collective action against a company. Under German law, this was previously not possible. In 2004, Deutsche Telekom's 15,000 shareholders wanted to sue the telecommunications provider for misleading them about the true value of its assets when it went public. As each case had to be heard separately, the Frankfurt regional court was overrun with cases, so lawmakers introduced the Capital Investor Model Procedure Act (KapMuG). This act meant that groups of shareholders could now bring a representative class action against a company, but not consumers. To enable consumers to take action against VW and obtain settlements, German lawmakers sought amendments to the KapMuG. According to Tobias Ulbrich, a lawyer with Russ Litigation, a law firm established to allow VZBV to represent the class action lawsuit, the statute of limitations for suing a company for damages in Germany is three years after all circumstances on which the claim can be based is known. As the allegations of the diesel emissions cheating scandal first hit in September 2015, this meant that any legal action has to be taken before the end of 2018. Mr Ulbrich said that it was a condition of the Social Democratic Party (SPD), when it agreed to form a coalition government with Angela Merkel's conservative Christian Democratic Union (CDU), that a law enabling consumers to bring collective legal action against VW would be enacted. "For a lot of families this is a big problem - even after returning the [affected diesel] car, they have to pay the financing on the old car, and then, if they want to get a new car, they have to pay the new financing as well," he told the BBC.